In the South Valley, residents are blessed to have a variety of annual festivals taking place throughout the year – the recent Exeter Fall Festival and Springville Apple Festival, and Lindsay’s Orange Blossom Festival in the spring are a few examples. Neighboring areas have celebrations, too. Perhaps the best known in the state is the Gilroy Garlic Festival in July, or the Jumping Frog Celebration in Calaveras County in May. Yes, it’s all about the pomegranate – well, and nuts, too! The pomegranate has been used in folk medicine for centuries in the Middle East, India and Iran. The health giving properties of the pomegranate are celebrated in a Jewish fairy tale, and it takes its place in Indian Ayurvedic medicine. The pomegranate provides a substantial amount of potassium, is high in fiber, and contains Vitamin C and niacin. 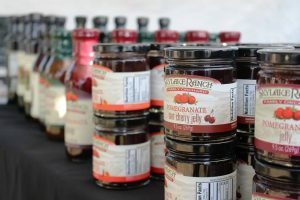 Madera is in the heart of pomegranate country, and the annual Madera Pomegranate Festival celebrates the connection to the heart-healthy fruit. There will be numerous vendors selling pomegranate-related items, food, live music and there is the always entertaining Pomegranate Grenade Launch. The festival features a full day of delicious pomegranate food and nuts, cooking demonstrations from local chefs, educational briefings on pomegranates and fun for the whole family. There will be pomegranate and nut-inspired foods and products to taste and purchase. Learn about the flavors of pomegranates and local nuts such as almonds, pistachios, and walnuts through the live cooking demonstrations. Learn new recipes. Admission is free. For more information, visit www.pomegranatefestival.com/. This year’s Big Sur Food & Wine Festival will be the event of the year for the area as they celebrate a new bridge and the resiliency of the Big Sur community. Thursday 10am – Magical Mystery Tour – Shuttles will whisk you away to some of Big Sur’s most spectacular and unique properties. One-part Hiking with Stemware, one-part Garden Party, one-part mystery. You will experience wine and food tasting in amazing private North Coast Properties that are open to only you and only on this day. Friday 6-10pm – A Return to the Big Sur Jazz Festival at the Henry Miller Library. While the rest of the Peninsula is celebrating the anniversary of the Summer of Love, here they will be celebrating fond memories of the great years of the Big Sur Jazz Festival. For those who remember, lucky enough to have attended or just wished you had, there may be nowhere more special than under the Big Sur redwoods to enjoy jazz, food and wine with friends. Saturday 10:30am – 3:30pm – Hiking with Stemware – A truly unique event on the amazing Rancho Rico property. A condor has been seen perched on the fence near the barn and red-tailed hawks can be seen playing above the ridges of this spectacular property, home of the now famed Big Sur Fiddle Camp. The Festival is always grateful to the Chappellet family for hosting this event, and delicious lunch to follow. Limited to 36 guests. There’s more – visit www.bigsurfoodandwine.org/events/ for more information. For 20 years, Lodi’s Sandhill Crane Festival has celebrated the return of the cranes. In partnership with the City of Lodi, the Festival continues this November, welcoming an ever-growing circle of friends to the community to share the wonder of the Sandhill Crane … and so much more. 7:30am – Saturday or Sunday morning Birdwalk Through the Wilderness for all skill levels. Bring your binoculars and enjoy a leisurely walk on flat ground through the old growth riparian habitat at Lodi Lake Wilderness Area with a local birding expert. Learn the basics, or hone your skills in identifying the many birds that reside or frequent this outstanding area, which is also home to other species, including deer, beaver, fox, possums and turtles, to name only a few. 1:40pm – Sunday Bird Carving Workshop – Join master carvers from the Pacific Flyway Decoy Association to learn how to carve a bird from wood. All the necessary materials including a study guide and carving knives will be provided. Short lectures with lots of hands-on carving time will enable you to complete a perching Mourning Dove. There are a lot more activities with this festival including an art show. Visit www.cranefestival.com/index.php for more information and to register for specific tours or events. Some of the sweetest mandarin fruit comes from the golden hills of Placer County, east of Sacramento. The annual Mandarin Festival in Auburn celebrates the crop with an outdoor / indoor event containing thousands of mandarin recipes in contests, foods you can buy and eat, and sweet 10 pound bags of mandarins to take home with you. A little known fact is that 10 ounces of mandarin juice contains as much synephrine as a Sudafed decongestant tablet. Placer’s popular Owari Satsuma mandarins pack a jolt of synephrine, a natural antihistamine that relieves cold and allergy symptoms. A Mandarin Recipe cooking contest, professional chef demonstrations, food, artisan crafts, and activities featuring the Mandarin orange, a Peel & Eat contest, live music and entertainment are focused on the region’s healthy crop. Smell the citrus in the air and discover chocolate-covered fresh Mandarins, Mandarin pizza, pulled pork, and English Scones with Mandarin Curd. Visitors can take home Mandarin BBQ sauces, syrups, olive oils, dressings and dozens of other Mandarin inspired concoctions. Admission – $8; parking – $6. For more information, visit www.mandarinfestival.com/. Saturday – 10am – 6pm; Sunday – 10am – 5pm – It all started in 1992 with an idea by Dave Hernandez, a member of the Downtown Indio Merchants Association. The rich heritage of the tamale, consistent community support and hard-working tamale makers have created the festival’s tremendous success. The festival celebrates the rich heritage of the tamale. Recently, the Food Network-TV ranked the Indio International Tamale Festival in the Top 10 “All-American Food Festivals” in the nation! Beside a vast array of tamales, there is also other food and drink, a farmers’ market, music and entertainment, Art in the Park, a car show, Kiddieland and a carnival. Held in Oldtown Indio, the Festival is between Highway 111 and Indio Boulevard and fills-in the streets of Miles, Towne, Smurr and Requa. For more information, visit www.tamalefestival.net/.